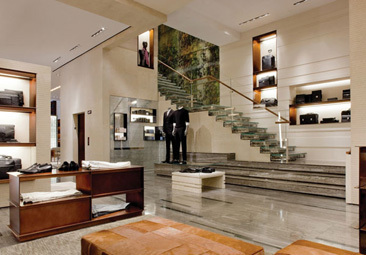 For Ermenegildo Zegna, an international men’s luxury clothing and accessories brand, renovating its Fifth Avenue location in Manhattan provided the opportunity to convey the story of the Milan, Italy-based family-owned business and the principles that have guided it for nearly a century. 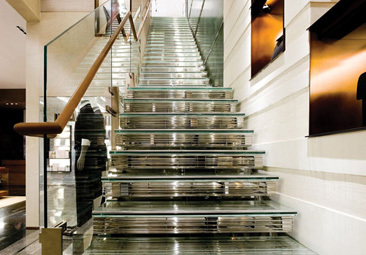 Inspired by Zegna’s roots in the textile industry and wool mill the Italian Alps, Architect Peter Marino & Associates designed the three-level 9,200-sq-ft store as an “elegant townhouse” with features that resemble a loom in action.Construction began in May 2007 and was completed in January. Each level and room has a different use and, therefore, a different atmosphere that is best suited for the clothes and other items offered for sale. 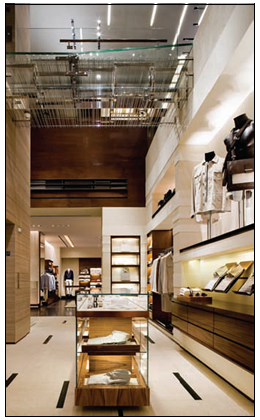 Behind a 22-ft-tall glass entryway, which boasts 900 sq ft of continuous glass, a contemporary combination of upscale finishes and materials provide both abstract and literal references to yarn, various fabric types and other signature elements of the Zegna brand. To achieve this vision, the project team needed a clean slate from which to begin. Shawmut Design & Construction had to remove a considerable amount of the existing Zegna store’s interior structure to produce the open feeling envisioned by the architect-not an easy task on a site situated on the first three floors of an eightstory early 20th Century brick building and located along one of New York City’s busiest streets. To protect the brick structure and minimize disturbances to adjacent tenets, all of the interior demolition work was performed by hand during periods when activity in the building was light“. Because the store’s Fifth Avenue side was also the most logistically feasible place to move large equipment and materials into the store, we had to acquire offhours permits to place a crane that allowed us to hoist those items through the front door and an upper story window,” adds Les Hiscoe, Shawmut’s vice president of retail. connects an elevator door and a nearby corridor 44 ft above the main floor. Another design element that required painstaking precision from the construction team was the plasterwork. Nineteen different plaster finishes were needed. Shawmut conducted multiple plaster mock-up sessions under various lighting conditions to ensure that the colors and textures met the design intent. Just as Zegna has long sourced materials from around the world for its highquality textiles, many of the new store’s interior materials came from Europe, presenting Shawmut with a multinational coordination challenge on top of a tight construction schedule. 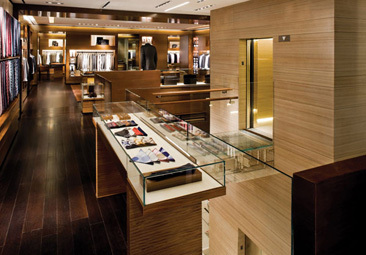 For example, the project team flew a union electrician to Italy to coordinate the integration of the store’s lighting design into the millwork so that the panels could be properly installed upon arrival in New York.